The slim design of the Conduit Carrier Cart (CC) is great for narrow aisles where a forklift simply cannot fit. The heavy-duty base frame provides the maximum capacity while taking up a minimal footprint, leaving valuable floor space available for the next project. The locking rigid casters prevent unwanted load movement, while the swivel casters and welded handles improve ergonomics during transportation. The Conduit Carrier Cart is available in two models, one with a 3,000-pound capacity and one that handles up to 5,000-pound loads. The steel frame, buttressed by extra spanners, will support bulk quantities of rigid steel, PVC, flexible metal, or any other common form of electrical conduit. The Conduit Carrier Cart allows electricians to position whole runs of conduit right at the install site, improving overall job efficiency considerably. 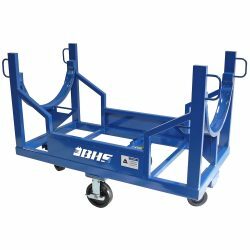 To learn more about how Conduit Carrier Carts and other Electrical Equipment from BHS can improve working conditions in your business, call our sales team at +1 314 423 2075.